As announced earlier, we have released new, quality interiors for the 3i Series that provide every user with the best of both worlds: soft case adaptability with the unparalleled strength and durability people expect from SKB's versatile, airline-tough cases. 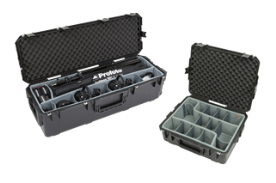 The new 3i Cases with divider sets feature a deluxe deep closed cell fitted foam liner, heavy duty hinged dividers, padded sub-dividers, and/ or heavy duty divider. All of which are Nylex-wrapped and designed with heavy duty hook-and-loop tabs to create the perfect fit for lighting stands and other accessories. 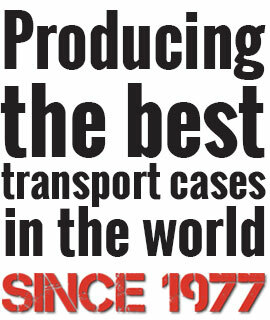 The current 3i Cases with dividers will be replaced by the new ones using a phased approach. So as soon as we run out of stock of the old article number we will provide you with the replacement article. The new part numbers have a different logic compared to the old one. Where the old ones were like 3i-xxxx-xB-D, the new ones are 3i-xxxx-xDT; for example 3i-1309-6B-D will now be 3i-1309-6DT.